This was a double blind, placebo controlled randomized trial of patients with nausea and vomiting from a confirmed malignant bowel obstruction. Patients were enrolled at multiple sites by providers from different specialties (ER, general medicine, oncology and palliative care) after the diagnosis was confirmed and assuming they did not meet criteria for immediate surgery or chemotherapy. Patients were randomized into Standard Therapy (placebo + IV dexamethasone, Ranitidine, IV hydration) or Octreotide groups (standard therapy + octreotide 600mcg infused over 24 hours). They included patients older than 18 years with advanced cancer, presenting with vomiting from malignant bowel obstruction between August 2008 and May 2012. They excluded patients who had immediate indication for surgery or cancer directed therapy after consultation with the patient’s oncologist. Additional exclusion criteria included severe renal impairment, cirrhosis, existing venting G or J tube, a previous adverse reaction to any of the study drugs, and an Australian-modified Karnofsky performance score of less than 30. The authors looked at a lot of different outcomes. The primary outcome was the number of days free of vomiting as reported by patients at 72 hours. They also looked at a host of secondary outcomes, including a patient-rated Global Impression of Change (GIC) scale, number of patient-reported episodes of vomiting per day, survival, nausea, brief pain inventory, functional status, PRN medication use (as dictated by the study protocol), and treatment failure. Treatment failure was defined as persistent vomiting, insertion of NG or venting G tube, or surgery. The PRN medication protocol included hyoscine butylbromide (an anti-spasmodic medication) for colicky pain, opioids for non-colicky pain, and haloperidol or metoclopramide for nausea and vomiting. Did Octreotide work for malignant bowel obstruction, as measured by the primary outcome? No. There was no difference in mean number of days free of vomiting between the octreotide (1.87 days) and Standard Therapy group (1.69), with p-value of 0.47. In fact, patients in both groups demonstrated a significant drop in number of episodes of vomiting between day 0 and day 1. There were also no differences detected in patients reported Global Impression of Change scores, presence or intensity of nausea, pain scores, or survival. Patients in the octreotide group were more likely to be administered hyoscine butylbromide for colicky abdominal pain (p=0.004). The study was not powered to detect differences in secondary outcomes. Of note, the authors comment in the results section of the paper that after an adjusted multivariable regression analysis of secondary outcomes, they found a statistically significant reduction in the number of episodes of vomiting in patients treated with octreotide (RR=0.40, p=0.019). Interestingly, this was not mentioned in the discussion section and did not appear to influence the authors conclusions. It is worth mentioning that the dose of octreotide used in this study was higher than that in previous studies (600 mcg/24 hours), and the authors do not address this. In addition, the standard regimen of IV ranitidine and dexamethasone used in both the control and treatment arms of the study is far from universal, and in fact varies widely across clinical practices. Importantly, patients in both arms of this trial reported marked improvements in symptoms and overall GIC score over the course of 3 days -- in particular between days 0 and 1. This change was statistically significant, and highlights that patients in both arms tended to improve, regardless of whether they received octreotide. Whether this reflects the natural history of malignant bowel obstructions in this population or the efficacy of the "standardized" medical therapies given to both groups is not clear. Additionally, this study does not tell us about the potential benefit of octreotide therapy beyond a 72 hour window. Questions about the benefit of longer term dosing of octreotide in patients with recurrent or non-resolving malignant bowel obstructions are not addressed by this study. What’s the take home point? Ultimately, the results of this well designed and rigorously implemented randomized control trial do NOT support the use of IV octreotide in the acute management of malignant bowel obstruction. Not only did octreotide fail to demonstrate a reduction in vomiting over a 72 hour period (primary outcome), there was no meaningful difference in any of the secondary outcomes – such as pain, episodes of vomiting, or nausea. The lack of demonstrated benefit is important because octreotide is a costly medication that requires either continuous, frequent subcutaneous or IV dosing, or long-acting depot formulations that may take several weeks to reach therapeutic levels. Furthermore, the observed increased use of anti-spasmodics in the treatment group raises the possibility that octreotide may even contribute to abdominal discomfort in these patients. Except for the fact that it works dramatically in well selected cases in my practice. I can't explain the study when its use in a regimen with steroids, haloperidol, hyoscamine, and odtreotide works in practice. I use them in a very individualized and nuanced fashion, but I guess I could be under a delusion. 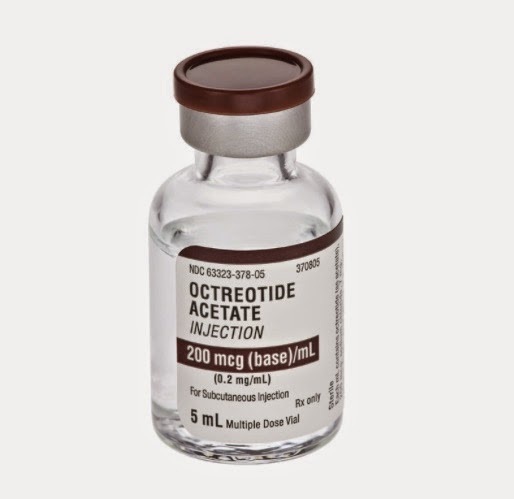 I use octreotide in complete malignant bowel obstructions and in cases of trapped loops of bowel that are non-operable for clinical or goals of care reasons. The decrease in NGT output and/or vomiting and abdominal pain is very clear and dose-related in my experience. I would be very cautious about saying that octreotide has no role in complete bowel obstructions, as I believe strongly that it does. Prematurely concluding that this drug has no role is incorrect and may preclude patients from getting the appropriate treatment in this challenging and much-feared condition. For partial bowel obstruction, steroids can help peritumoral inflammation and may allow the obstruction to resolve without octreotide. Antiemetics can help with the nausea and vomiting in various ways depending on their pharmacology. At times, complete obstructions can become partial obstructions with steroids and antiemetics and trials of bowel rest and/or NG suction and/or octreotide. This study did not delineate how many of these patients had complete obstructions, whether the partial or complete obstructions resolved, or even if partial obstructions progressed to complete. If nausea/vomiting resolved after 3 days, especially in small bowel obstructions, I can only assume that the obstruction resolved as well, as the GI fluid output otherwise has no place to go and the vomiting would continue. I respectfully disagree with your take home point that octreotide has no role in malignant bowel obstruction. The study's conclusions are incomplete and will not change my practice as they did not differentiate between partial and complete bowel obstruction, did not indicate whether the obstructions improved/resolved, and they did not titrate the octreotide according to symptom burden to achieve palliation as we should do with all medications in clinical practice.